Tensioners are useful in tensioning canvases on old stretcher bars without needing to replace the original stretcher bars. We manufacture our Tensioners out of solid copper and brass. They are available in both a nail-on type that comes with brass nails, and a screw-on type that comes with brass screws. The picture shown is actual size. 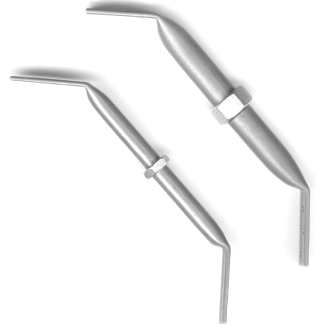 The smaller one (Light-Duty) has a nailing flat dimension of 3/8" in width. The larger of the two has a nailing flat dimension of 9/16" in width. Tensioners come packaged by the set, with each set containing 4 corners plus screws or nails, and a master pack (containing 6 sets).